Shirosaka was recommended to me by a local, one who knows how much I appreciate fine dining with a healthy dose of friendly charm thrown in. I also wanted to try a place that might not be as well-known and is relatively new. And boy, did he make a good recommendation with Shirosaka! In fact, I recommended it to another fierce critic friend of mine, and she loved her time there too. On that note, Ode was another restaurant recommended to me by the same local, and one that again, was good. Slightly less convivial, but the food, fantastic. Using the trusty GPS, we miraculously managed to find the restaurant without any major detours in the posh neighbourhood of Akasaka. Well, we did walk a few steps past the discreet entrance before common sense about the locations of Japanese fine dining kicked in, and told us to carefully look at the door entrances. And then we saw it. It’s located next to Libero, what looked to be quite a happening bar/restaurant, well, it was a Friday night, so there were many people spilling over to the outdoor seats, so maybe if you’re walking to Shirosaka, you can look out for the sudden change in setting right next door. 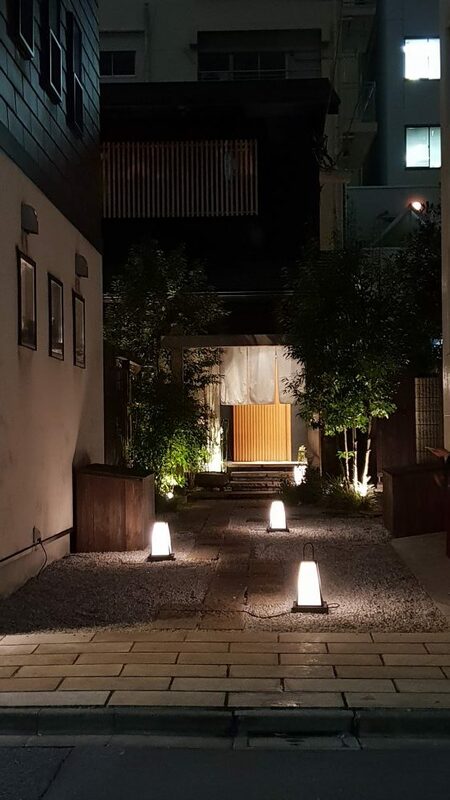 A lantern-lit stone path in a small garden leads to the entrance, and with that kind of beginning, I was expecting to enter a room of hushed voices and genteel, almost snooty service. 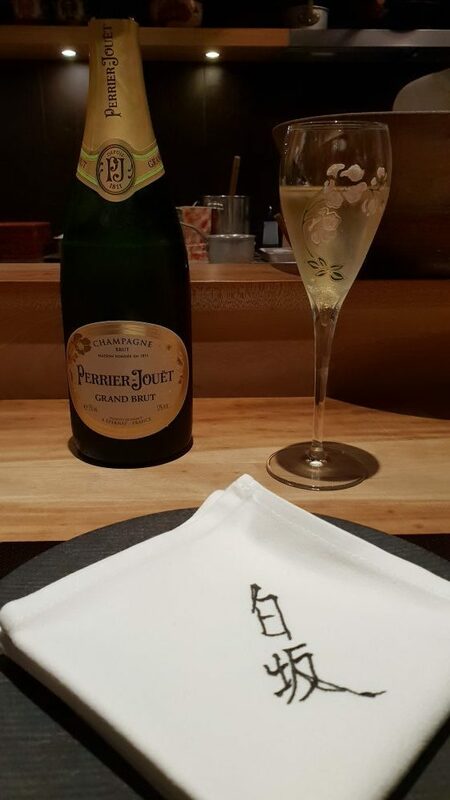 Nothing like bubbly to get the party started! But nothing of that sort at Shirosaka. 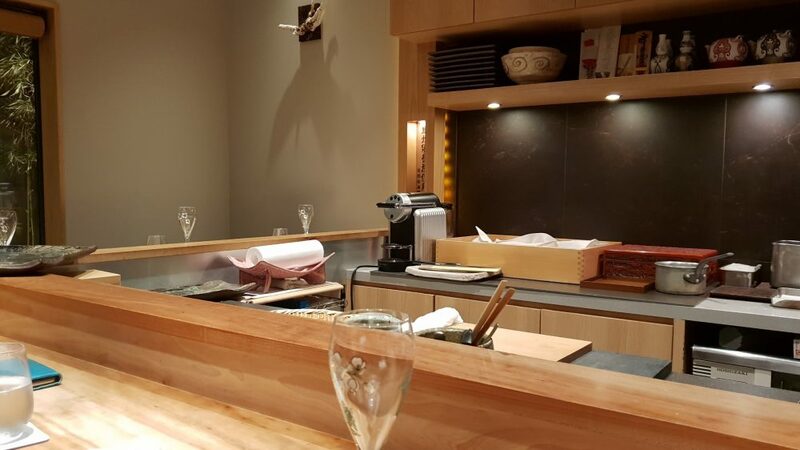 There are only 10 seats around the cherry wood counter, and when we arrived at around 7pm, there were already 2 couples halfway to sake heaven. The first pair – colleagues, it would appear, had the Japanese woman enlightening her foreign co-worker on all the dishes that were placed in front of them. A great thing for me to have sat next to her, as I could eavesdrop while she was translating to her colleague. And on the right, 2 local ladies who were celebrating a birthday. In fact, as a show of non-stuffiness, when the dessert rolled out for the birthday girl, all of us broke into song to celebrate with her. 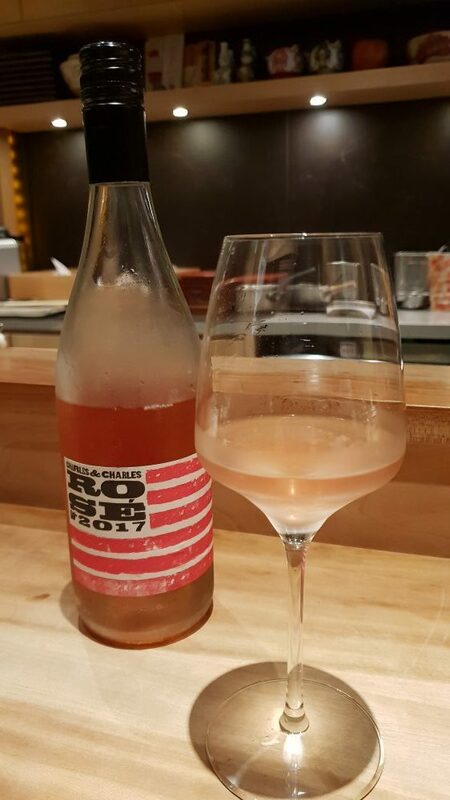 Head Chef and Owner Hideki Li, previously from Tetsuya Sydney, was (ironically) away in Singapore, but chef Max Barber held court very well I would say. 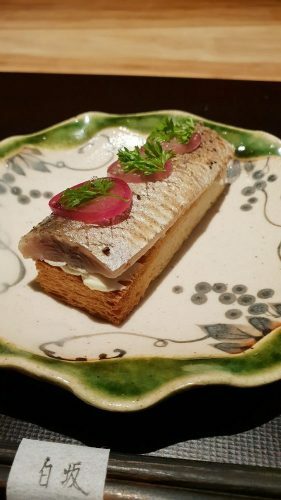 While he, of course, was the star of the show – the guy was the one cooking the fabulous dishes, and it didn’t hurt that he looks like a mature member of a boy band, I was entertained non-stop by the effusive Manager/Sommelier Kota Kaito. It was like we walked into his house party, that’s what a great host he was. 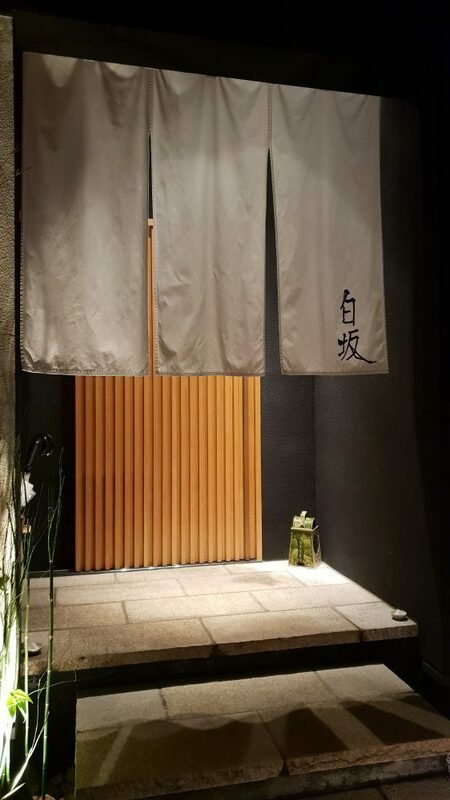 It’s kappo-ryori, essentially, damn good Japanese fine dining. 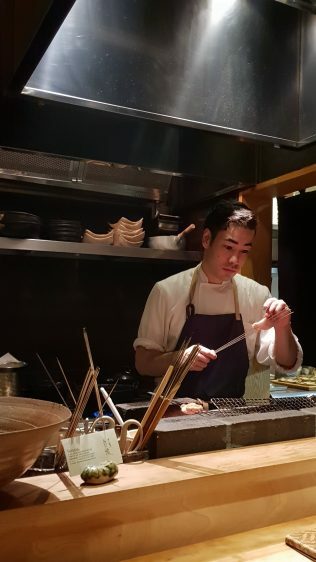 It’s all up to the chef, his and the season’s sensibilities and especially at Shirosaka, it’s a focus on seafood, charcoal-grilling, with a mix of tradition and modernity. Now, this is where I am going to fail you as a food writer. 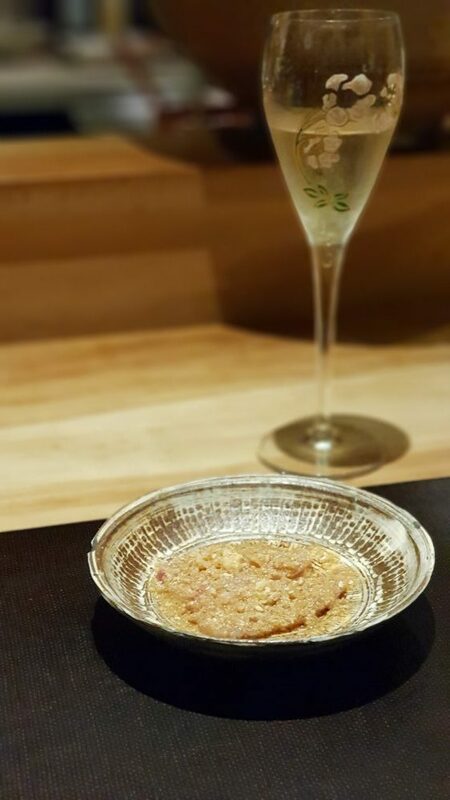 For this meal, I wanted to fully savour everything, and I wasn’t concerned with taking any mental notes of what I was eating, just maybe the emotions I experienced. And considering that my meal was almost 2 months back, you can bet I cannot recall my swordfish from my snapper. That said, what I remember is the focus and care that the chef imparted on every single piece of ingredient, carefully examining each piece before skewering it delicately and keeping a hawk-eye on as he grilled it. Then the immaculate plating, so delicate and fine. And finally, the taste, of course. Every dish a delight. Really. What a great start to the meal! 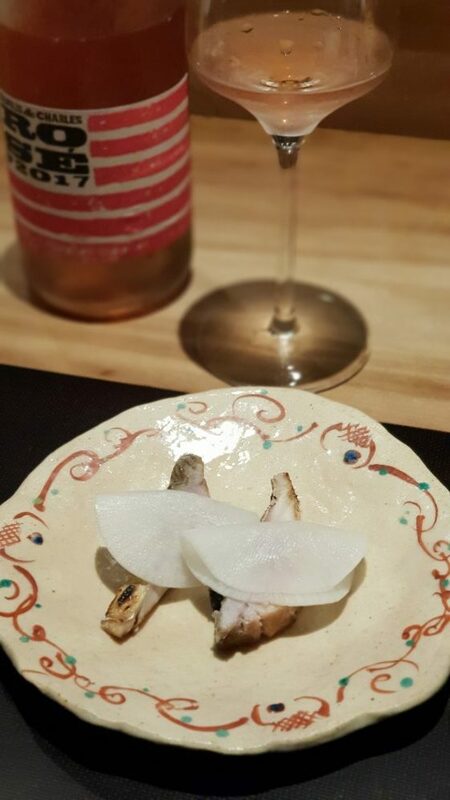 The pickled radish was the perfect foil to the grilled (and strong-tasting) mackerel. And the memory loss starts with this dish. I know it was oh-so-yummy with the sesame paste but… which kind of white fish was beneath the sauce? Hmm. And another. I simply cannot recall which type of white fish this was. Sorry! 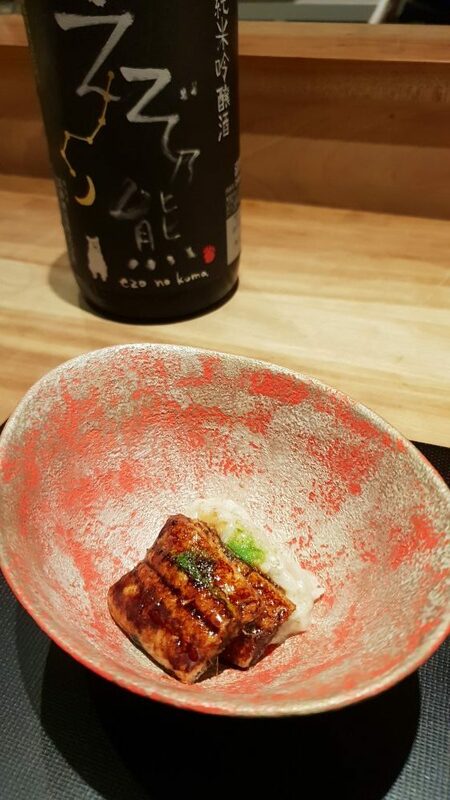 Unagi, which I am pretty sure I could smell before it even came to me. Delicious. 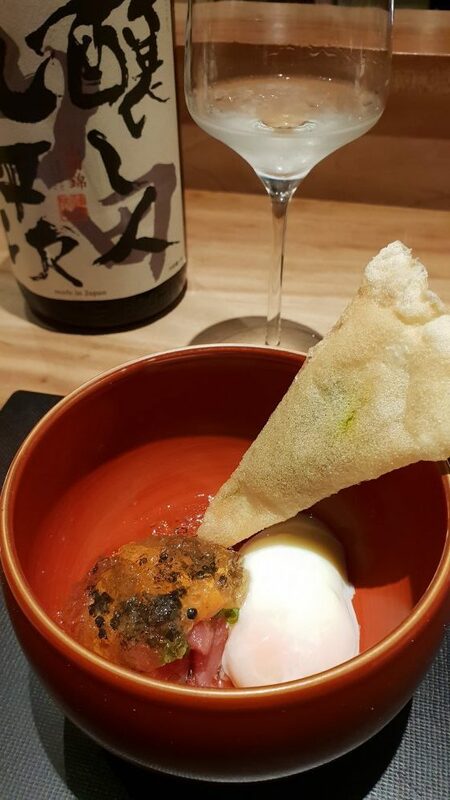 Mmm… tuna, uni and onsen egg. Mix it all around and enjoy the flavours. Definitely not just the soup of the day. 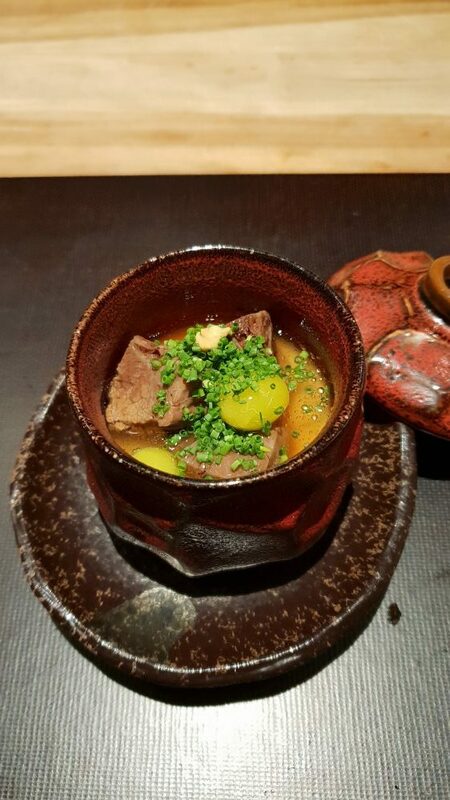 It was a beef broth with gingko nuts and it was so moreish. I’m guessing this was the snapper, with crisped scales. 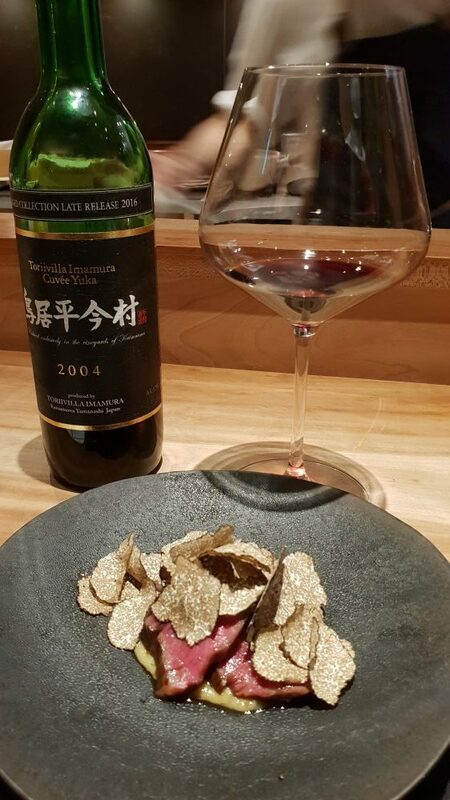 Asides from the mountain of earthy black truffle shavings, the wagyu beef was, needless to say, out of this world. 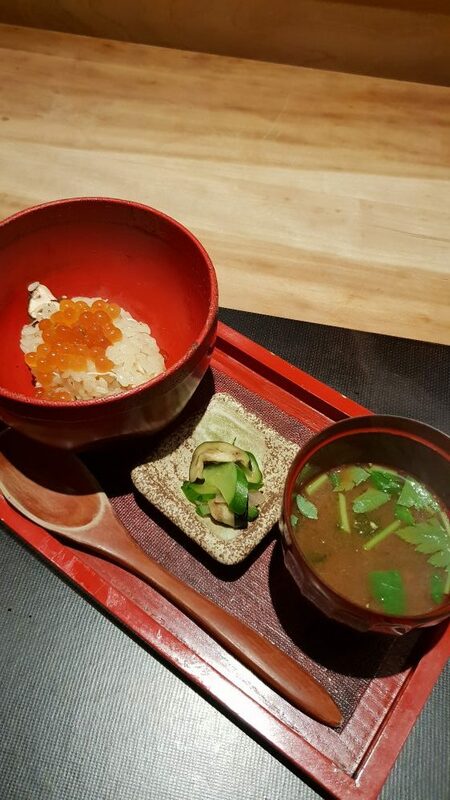 Classic finish with rice, pickles and miso soup. Of course, every element of this basic dish was just that little bit more special. What I notice is that after an intricate and exemplary Japanese fine dining meal, the desserts are usually kept simple. This is Shirosaka’s take on the monaka – a traditional Japanese sweet that normally features red bean paste between two thin crackers made from mochi rice. We took the wine pairing, and no regrets at all. 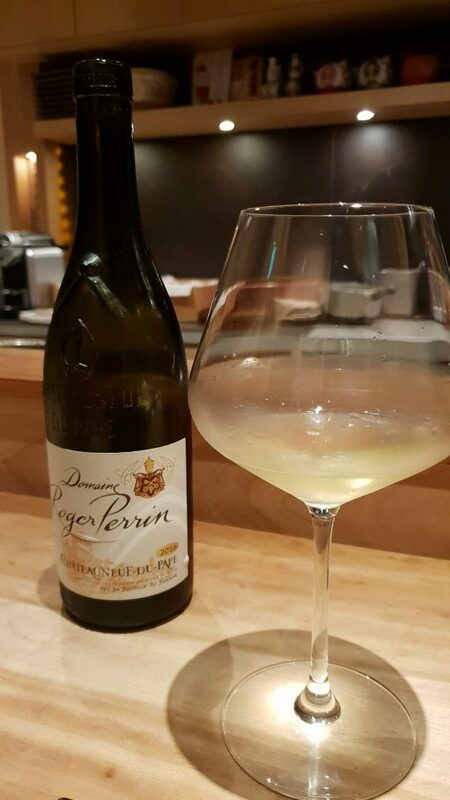 Enlightening and enjoyable, we never shied away from asking for a little more if there was a particular wine we liked, which Kota-san would happily pour for us. Kota-san was also very happy to teach us sake noobs about what we were imbibing and in a way, go through the whole sensory experience of pairing with us. 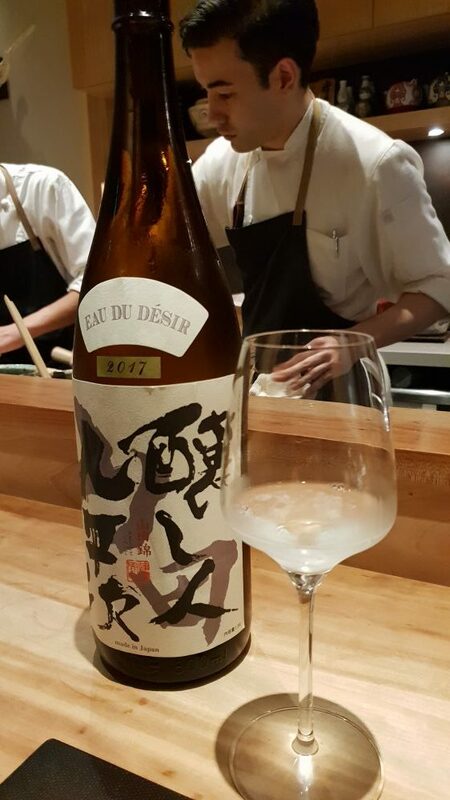 Ok ok, not to just show you the handsome chef (again) but to also show you the sake that is, as explained by Kato-san, bottled like a French wine on purpose. For the amazing quality, the price you pay is almost unbelievable. 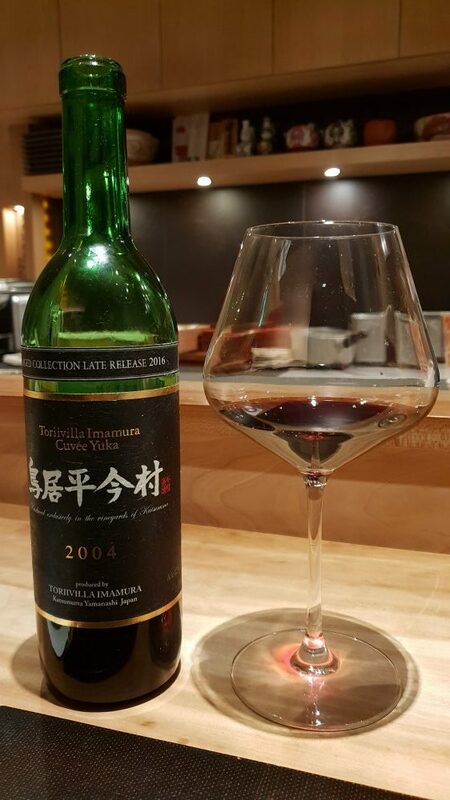 My most expensive meal ever was a few years back at another superb restaurant, Takazawa, where I took the wine pairing as well, and ended up paying around $700 per person. 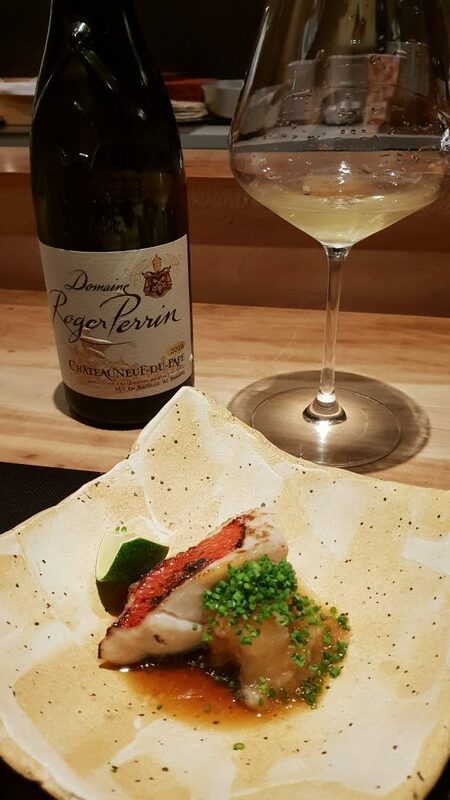 After that incident, I told myself I’d consider wine pairing options more carefully in future, as the wine pairing cost at Takazawa was as expensive as the meal itself. That said, I still count Takazawa as among, if not the most, memorable dining experiences I have had through my years of fine dining. I did not have my blog up when I dined there in 2013, so unable to share, but it’s a definite must-do, if you are so-inclined, at least once. 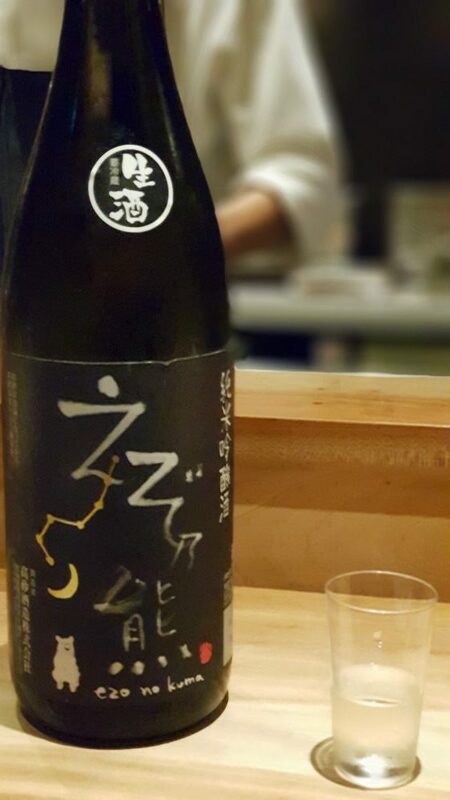 At Shirosaka though, together with wine pairing, it was around ¥18,500 (S$250) per person. 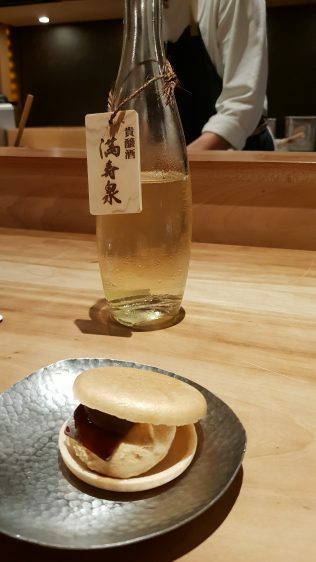 Despite the fact that I hardly return to restaurants since I want to save my gastro budget for new places, Shirosaka is one place I’d gladly go back to when I am in Tokyo.